The mission from Japan came on 21st till 25th of February to make the plan for the second phase, which is the primary phase of the project. The mission members were five, including Mr. Maekawa, Senior Manager of Department of Regional Planning of Cities, Mr. Yamauchi, Director of Chamber of Regional Environmental Research in the National Research Institute for Cultural Properties in Tokyo, Mr. Matsuda, Tohoku University of Art and Design. They confirmed the implementation system of GEM project and had discussion with the executive team of the Egyptian side in order to make a detailed plan for the second phase. 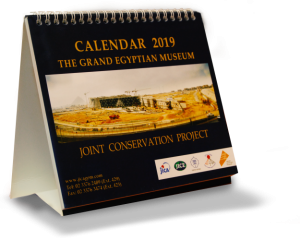 The project has been in a preparatory phase for the last one and a half years due to a delay in recruitment of the conservators of GEM-CC, the Egyptian counterpart of this project. However, the project is expected to start the second phase, which is the full fledged cooperation, this fiscal year. During the discussion, it was agreed to move to the second phase once the required personnel allocated in the GEM-CC and the GEM-CC opens. Till then a decision has been taken to extend the first phase at latest up to the end of March 2011. During the discussion, both sides agreed on the draft of the capacity development plan prepared on the basis of the field research made by Japanese experts in November. The plan is a comprehensive training program, through which conservators could develop various skills required during the process starting from transportation of the artifacts from all storerooms to the display and storage. It has been agreed that, before the comprehensive program start in the second phase, the training on the fields of high priority, such package, transportation, fumigation and integrated pest management, etc., would be continually provided. As for the database developed by the ADD, the Egyptian side strongly requested to expedite the work. However, the delay was caused by a lack of the required arrangements by the Egyptian side, especially in the Egyptian Museum in Al-Tahrir. We explained to the Egyptian side that, if they can provide proper arrangements and preparations, the work will be done faster. On the other side, the Egyptian side requested for the ADD to continue its support in order to compile the database till the soft opening of the museum in 2012, but the Japanese side showed their intention to hand over the work to the Egyptian side in April 2011. In general, since the Egyptian side added new members to discuss with the mission team, we hoped to have deep discussions on issues such as human resources development plans. But, unfortunately, the members remain the same and it all ended with disappointment. There was a suggestion addressed to the Egyptian side to assign a group of experts for discussing the technical consultations, but it was refused by them, moreover there was no time to discuss the R/D plan, thus it has been postponed. So strong interaction is necessary to continue work later on.